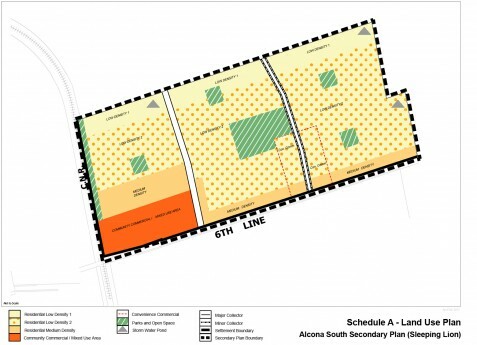 Alcona South Urban Boundary Expansion and Subdivision – Bousfields Inc. The Cortel Group has expanded the urban boundary of Alcona to their site in south Alcona along the 6th Line, west of Lake Simcoe. The Cortel Group has retained Bousfields to provide planning services with respect to a proposed residential / mixed-use community that includes a high-density transit-oriented node, low and medium density housing, parks and trails. The proposal will include new flood remediation infrastructure and storm management which will result in a reduction of phosphorous loads into Lake Simcoe. This project has involved several policy matters relating to the Provincial Growth Plan and Lake Simcoe Protection Plans as well as County and Town policy documents. Bousfields prepared a Planning Rationale and project management services relating to the private Official Plan Amendment application as well as planning advice relating to the Alcona South Secondary Plan (Sleeping Lion), approved by Town Council to permit development on the site. Bousfields provided expert evidence in support of an Official Plan Amendment to expand the urban boundary to allow for the implementation of the Secondary Plan. Bousfields is now working with Cortel to prepare rezoning and draft plan of subdivision applications in accordance with the Alcona South Secondary Plan (Sleeping Lion). Images courtesy of Bromont Homes Inc.